This week fans of crime fiction or good fiction in general will be hitting bookstores in droves for Don Winslow’s eagerly awaited masterpiece (and our MysteryPeople Pick Of The Month) The Force. This story – both intimate and epic – focuses on Denny Malone, a New York cop who heads up an elite unit and who’s corrupt practices catch up with him. The book gives a detailed view of today’s New York through police eyes. Don was kind enough to talk to us about the book and the world that inspired it. MysteryPeople Scott: The Force shares some DNA with Seventies-era NYPD books and films like Serpico, Prince Of The City, and The Seven Ups. What was the main difference of the of the police force at that period and the post 9-11 one you write about? Don Winslow: I was really influenced by both the books and the films of The French Connection, Serpico and Prince of the City. They’re part of the reason I became a crime writer. In some ways, things haven’t changed – police work is still police work and cops are still cops. But 9/11 did change things, especially in New York City. As the primary target of that attack, the city shifted a lot of resources from organized crime to anti-terrorism. Because of that the Mafia, which had been on the verge of extinction, made something of a comeback. Another major change has been one that has impacted society as a whole – computer-generated data. Police have largely adopted the ‘metrics’ that we see in business and sports, using sophisticated crime statistics to assign personnel, patrols and other resources to high-crime areas. The other major change is also technologically driven – the rise of personal cameras in mobile phones. Police used to work in relative obscurity, but now everyone is a journalist, putting police under an intense public scrutiny which has changed the public perception of police. Police shootings and brutality have always existed – the difference now is that they’re on social media. I’ve often said Don Winslow dances with his readers. With both ease and flair he moves us through a story, no matter how complex the plot or dark the subject matter, leaving us back in our world entertained and exhilarated. For his latest, The Force, it feels like a samba with intricate, nuanced moves that he leads us through at a quick tempo. He places us in the point of view of Denny Malone, leader of an elite New York City police unit, often referred as The Force on the streets, tasked with getting drugs, guns, and gangs off the streets of Manhattan North with few questions asked. A major bust just put them in the headlines, at the cost of one of their men. What the public doesn’t know about Denny and his unit is the bust wasn’t on the up-and-up, they’re on the take from rival dealers, and the Force has a piece of several different pies. When he’s caught in a shady deal with a lawyer on Christmas day, an ambitious prosecutor and a couple of feds pressure him to act as an informant. Denny agrees, as long as he doesn’t rat on any cops. The book covers roughly half a year, centered around Christmas, Easter, and The Fourth Of July, as gang retribution, city politics, and Denny’s personal life put him in a tighter and tighter corner where his loyalties to his men are tested to the brink. The Hard Word Book Club kicks off the new year with a mammoth book that will easily go down as one of the best crime novels of the decade, and possibly of the century. Don Winslow’s The Cartel got much acclaim in 2015 with its detailed and emotional look at the drug wars of the new millennium. To make this truly an event, Mr. Winslow has agreed to call into our discussion. The Cartel works as both a stand-alone and sequel to his equally superb The Power of the Dog, with DEA agent Art Keller, coming out of retirement when his nemesis Adan Berra (based on real life narco El Chapo) breaks out of prison. Several others on both sides of the border get drawn into their vendetta with each other. Winslow draws from many real life incidents and people in this harrowing novel of money, violence, indifference, and corruption that can crush and entire society. This is a brutal book that pulls no punches. We wanted to announce this book as soon as we could, since it is a little over 600 pages. We will be meeting on Wednesday, January 25th, at 7PM, on BookPeople’s third floor. The book is 10% off in-store for those planning to attend. You can find copies of The Cartel on our shelves and via bookpeople.com. Today we bring you a special double Shotgun Blast from the Past, profiling two classic hardboiled crime novels – The Winter of Frankie Machine by Don Winslow, first published in 2006, and Cotton Comes to Harlem, by Chester Himes, first published in 1965. Frank Machianno is an upstanding member of the community on the San Diego pier. To those who can remember far back, like Dave White, the cop buddy he surfs with, he was Frankie Machine, an enforcer during the Mafia’s last heyday. 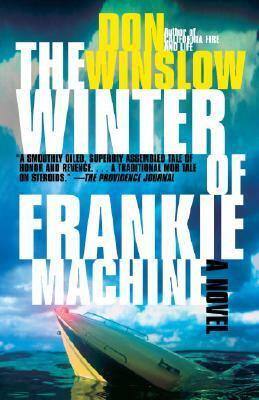 Through a very bad day for Frankie that reflects on a violent life, Don Winslow shows how you can’t put that past past behind you, in his character driven mob novel The Winter Of Frankie Machine. The Hard Word Book Club kicks off the year with a book that has turned out to be very topical. In The Power Of The Dog, Winslow looks at the history of the war on drugs in the last quarter of the twentieth century. The character of Adán Barrera, a powerful drug lord, is based on the recently recaptured El Chapo. You could say Barrera is the villain, but there are few innocents in this book. The main protagonist is Art Keller. Recently returned from working in Vietnam with the CIA, he heads to Mexico as an agent of the newly formed DEA. Keller initially befriends Barrera, who is simply the nephew of a drug lord. As Barrera takes over the cartel and builds his empire, Keller goes after him; the two pull several people into their battle, including a crusading priest, a high dollar call girl, and an Irish-American hit-man. Everyone is rendered vividly in a story that entertains as well as enrages. This is a book that provides a lot to discuss in style, story, and politics, so come ready. We will be meeting on Wednesday, January 27th, on the third floor at 7PM. The book is 10% off at the registers to those planning to attend. it’s over five hundred pages, so get started, but don’t worry – this action-packed novel will go quicker than you might think! You can find copies on our shelves and via bookpeople.com. The Hard Word Book Club meets the last Wednesday of each month to discussed hardboiled fiction and noir.